Stepping on bamboo, called "takefumi" in Japanese ("ta-ke" means bamboo and "fumi" means to step upon), is a very popular and unique form of maintenance exercise that is being practiced in Japan, China, and Korea, for centuries. A simple bamboo piece split in half is used as a tool for takefumi. Almost every Japanese home has one. 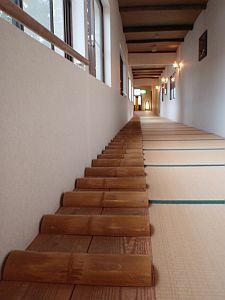 A pathway of takefumi prepared along the corridor of the school. According to a century-old traditional medical knowledge, takefumi can remarkably remedy a variety of illnesses such as frozen shoulder, back pain, cramps, numbness, hypertension, constipation, insomnia, depression, urinary trouble, atopy, and tinnitus. The takefumi Japanese bamboo foot massager is very easy to use. Simply place it on the floor with the rounded side up and stand on it. Then, work your feet back and forth to massage all areas of your feet. Our feet are being compressed by the forces of gravity all day long and somewhat creates a pattern of stress. This pressure challenges the muscles and bones of your feet and if it continues, it can cause the bones to become misaligned, nerves to become irritated, and muscles will begin to weaken. This effect can impact other muscular-skeletal parts of your body. Walking on bamboo helps decompress your feet and pushes it back into shape. These are the simple fundamentals of takefumi. You may get healthier and may live even longer, and you might forget your problems. Of course, you need to continue doing this to see good results—let's say for three months. You may get instant results whether it's a simple back pain, shoulder pain, or stiff neck and shoulders. Try it! You won't lose anything. IMPORTANT TIP: It is better to use green bamboo of about one to two years old. Why? Young bamboo tree is capable of absorbing energy from its surroundings, and the energy will reflect in healing or correcting your health condition. 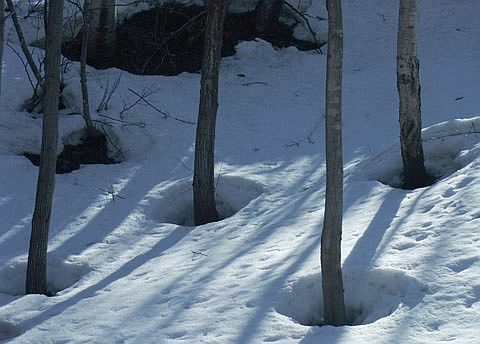 To prove it, notice how the snow melts around the trees when spring comes. There are several explanations to this. One, the heat from the sun has accumulated within the tree. 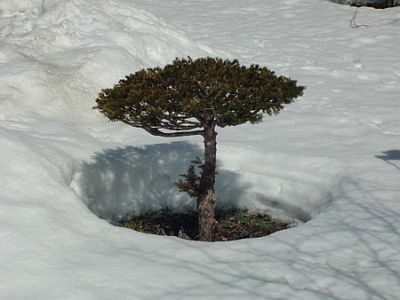 Second, our findings show that a young tree radiates infrared rays and other unknown energies, causing the snow to melt. I remember that an old Chinese medical book states that a green young bamboo tree has healing power when you step on it. 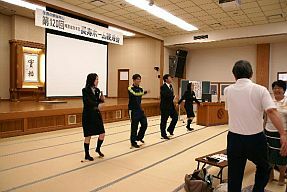 Aside from the takefumi, there is another century-old practice called "stone stepping" as seen in the photos below. 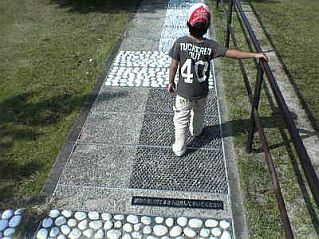 These are special paths (more often called the "Reflexology Path") that are made of pebbles where you walk barefooted around the pebble path. You may think that this can be done very easily, but in reality, it's not. You will feel pain the first time you do it. Of course, later on you can get the same result as takefumi. 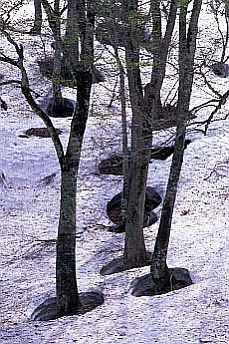 The takefumi "stepping upon bamboo" exercise can help revitalize your bone, muscle, blood vessels, nerves, and other related parts of your body. It is recommended that you perform this exercise 2 to 3 times a day with a total of about 180-200 or even 300 steps. 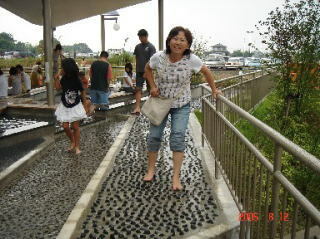 Of course, the most important thing to remember is to continue doing it for lifetime. Also count out "one, two, three..." loudly while doing the exercise. It will help a lot, and won't even cost you a cent. Yes, a lot of people ask how to cure or heal their illnesses. We like to advise you that you should do some exercises such as the "takefumi" or walking on a "pebble path" to build healthy body and avoid contracting incurable diseases beforehand. We, the PYRO-ENERGEN staffs are all healthy. Of course, sometimes, we catch a cold, but it's a simple common cold that lasts for a few days only. Most of us have been together for more than 30 years and some are over 40 years, and none of them suffered from any serious illness. Amazing? That's because we all do good works!